Copyright © 1995, 2017 by Aaron Shepard. May not be published or posted without permission. PREVIEW: Wali Dad, a humble grasscutter, never asked for wealth—so why can’t he give it away? In a mud hut far from town lived an old grasscutter named Wali Dad. Every morning, Wali Dad cut and bundled tall, wild grass. Every afternoon, he sold it as fodder in the marketplace. Each day, he earned thirty paisa. Ten of the small coins went for food. Ten went for clothes and other needs. And ten he saved in a clay pot under his bed. In this manner Wali Dad lived happily for many years. One evening, Wali Dad dragged out the pot to see how much money it held. He was amazed to find that his coins had filled it to the brim. Wali Dad thought and thought. At last he had an idea. The next day, Wali Dad loaded the money into a sack and carried it to a jeweler in the marketplace. He exchanged all his coins for a lovely gold bracelet. Then Wali Dad visited the home of a traveling merchant. The merchant was astonished, but he agreed to do what the ragged grasscutter asked. Soon after, the merchant found himself at the palace of the queen of Khaistan. He presented the bracelet to her as a gift from Wali Dad. When the merchant arrived back home, he brought the silks to the hut of Wali Dad. The merchant was amused, but he agreed. On his next journey, he presented the silks to the king of Nekabad. So the merchant brought the king’s horses to Wali Dad. The merchant thought this was very funny, but he consented. On his next visit to the queen’s palace, he gave her the horses. So in return for the ten horses from Wali Dad, the queen sent back twenty mules loaded with silver. The merchant was getting uneasy, but he could not refuse such a generous offer. So not long after, he found himself presenting the silver-laden mules to the king of Nekabad. The king, too, was perplexed and asked his prime minister for advice. So the king sent back twenty camels with golden anklets, twenty horses with golden bridles and stirrups, twenty elephants with golden seats mounted on their backs, and twenty liveried servants to care for them all. “How can I go to her again?” protested the merchant. But Wali Dad pleaded so hard, the merchant consented to go just once more. This time, the queen was stunned by the magnificence of Wali Dad’s gift. She turned again to her prime minister. So the queen ordered a great caravan made ready, with countless horses, camels, and elephants. With the trembling merchant as guide, she and her court set out to visit the great Wali Dad. On the third day, the caravan made camp, and the queen sent the merchant ahead to tell Wali Dad of her coming. “I fear we can do nothing!” said the merchant, and he headed back to the caravan. The old grasscutter started down the road. But he had not gone far when he heard a voice. He turned and saw two radiant ladies. He knew at once they were peris from Paradise. The peri touched him on the shoulder. To his amazement, he saw his rags turn to fine clothes. A jeweled turban sat on his head. The rusty sickle at his waist was now a gleaming scimitar. Wali Dad looked behind him. Where his hut had stood, a splendid palace sparkled in the rising sun. In shock, he turned to the peris, but they had vanished. Wali Dad hurried back along the road. As he entered the palace, the guards gave a salute. Servants bowed to him, then rushed here and there, preparing for the visitors. Wali Dad wandered through countless rooms, gaping at riches beyond his imagining. Suddenly, three servants ran up. “A caravan from the east!” announced the first. The bewildered Wali Dad rushed outside to see two caravans halt before the palace. Coming from the east was a queen in a jeweled litter. Coming from the west was a king on a fine horse. Wali Dad hurried to the queen. He rushed over to the king. And so the king of Nekabad met the queen of Khaistan, and the two fell instantly in love. A few days later their marriage took place in the palace of Wali Dad. And the celebration went on for many days. At last Wali Dad had said good-bye to all his guests. The very next morning, he rose before dawn, crept quietly from the palace, and started down the road. But he had not gone far when he heard a voice. He turned and saw the two peris. Again he sank to his knees. “Say no more,” said the other peri. “You shall have your heart’s desire.” And she touched him again. So Wali Dad became once more a grasscutter, living happily in his hut for the rest of his days. And though he often thought warmly of his friends the king and queen, he was careful never to send them another gift. 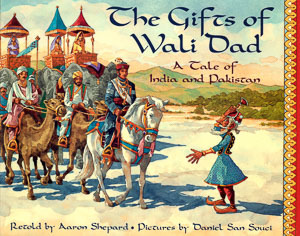 This is a retelling of “Story of Wali Dâd the Simple-hearted,” found in Andrew Lang’s Brown Fairy Book (1904). The tale was given to Lang by a Major Campbell—a British army officer stationed in India’s Punjab—who heard it from “an Indian.” Since the Punjab was later split between India and Pakistan, I have thought it best to attribute the tale to both countries. The dominant influences of the story are Islamic and Zoroastrian rather than Hindu. The paisa is the smallest Indian coin. Peris are an import from Persian mythology. Originally considered evil, their image changed gradually to benevolent beings akin to fairies or angels. It is said they feed only on the odor of perfume.